For Forex trading only. Can be used on any currency pairs. Not tested on Gold, Silver, and binary options . This is an efficient tool for both novice and experienced traders. 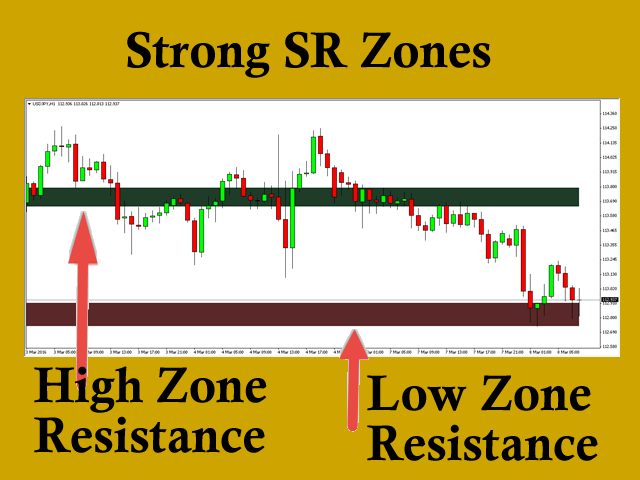 High Zone - the green rectangle in the chart. If the candlestick closes inside the green rectangle, the price may bounce back and forth inside it until it breaks the rectangle either the upper or lower line of the rectangle. If the height of the rectangle is more than 20pips, you can take advantage of the bounce and scalp 5-10pips. When the candle closes near the bottom line you can BUY LONG. When the candle closes near the upper line you can SELL SHORT. Low Zone - the red rectangle in the chart. If the candlestick closes inside the red rectangle, the price may bounce back and forth inside it until it breaks the rectangle either the upper or lower line of the rectangle. If the height of the rectangle is more than 20pips, you can take advantage of the bounce and scalp 5-10pips. When the candle closes near the bottom line you can BUY LONG. When the candle closes near the upper line you can SELL SHORT. When candlestick closes in between zones, the price may bounce back and forth between zones until it enters one of the zones. If the height of the distance between zones is more than 20pips, you can take advantage of the bounce and scalp 5-10pips. When the candle closes near the lower zone, you can BUY LONG. When the candle closes near the high zone you can SELL SHORT. You can message me for any question related to it. 1) HighZoneColor = You can choose now the color you want for high zone. 2) LowZoneColor = You can choose now the color you want for the low zone.